Actually I first started growing plants back in 1980 but I had to quit. I tell that story here. Then we bought a house in 1988 and in 1989 I started growing in the backyard at that house. And that’s really where my whole backyard nursery concept came from. Our lot was 1/2 acre and we had a pretty big front yard, so the space I could grow in the backyard was very limited. In the end, our Backyard Nursery ended up being 1/20th of an acre and on this page I will share the evolution of our little nursery. The reason that I started growing plants at all is because I wanted to invest a little money and get a good return on my investment. So I started by buying 1,000 Rhododendron rooted cuttings for a dollar each. Next year I bought 500 Japanese Red Maple seedlings for $1.35 each and 1,000 Dwarf Alberta Spruce rooted cuttings for one dollar each. Now keep in mind, you don’t have to invest that kind of money. I wanted to. I wanted to more than double my money. This is the very back of our yard. The white fence is the property line. In the foreground are the Dwarf Alberta Spruce (pretty tiny aren’t they?) and in the background the Rhododendrons and Japanese Red Maples. Those little tiny sprigs in the above photo, bottom left corner, those are the Dwarf Alberta Spruce that I paid a dollar for. The white stuff is snow. Kevin moving Dwarf Alberta Spruce rooted cuttings. Duston would have been about 8 years old in this photo. Many of you know Duston, he works in the business with me full time now and he is a brilliant Internet Marketer. Duston and I did a Webinar Series on Marketing/Internet Marketing, and if you participated in that, you know how smart he is! Duston and his wife have three boys. Kevin and his wife Gracie have a one year old daughter and are expecting a little boy in the next two weeks!!!!! (march 2016) You can meet all of the kids here! I know you are going to find this unbelievable, but the area where you see Duston and Kevin sitting in the wheelbarrows in the above photo became what you see in this photo a few years later. When I decided to start growing plants in containers I didn’t want to cover them for the winter so I decided to sink my growing beds into the ground by six or eight inches. The piles of soil that remained after I dug out the growing areas I simply turned into landscaped mounds. It’s from the plants on these mounds that we got the cuttings that we rooted in the nursery. In the photo you can still see the white fence and our backyard shed. Behind the shed is where our potting bench and pile of potting soil is hidden. You’ll see that below. Off to the right, along the fence is one of the container areas that I built, and off to the left the brick patio that we built at the same time I did the excavating. Using Leverage to Get Things Done. This is a fun and interesting story. I rented a tractor and I literally destroyed the backyard! I dug out two areas that would become the container areas you’ll see below. I dug a big hole for a sunken greenhouse, and I cleared an area for the brick patio. When I was all done the backyard was full of holes and huge piles of dirt. I wish I had gotten photos, it was a mess! The kids weren’t that old, but old enough to help some. Of course they wanted the latest and greatest of video games of the day. So I took them in the backyard, showed them what I, we, needed to accomplish and said; If you help me get the backyard to this point I’ll buy you the video game system that you want. Done deal! We all went to work and a few weeks later we reached the agreed upon milestone. They got their video game system, and the backyard was “sorta” put back together. They were happy, I was happy. Pam was also happy because the patio was done. Planting ornamental trees in the nursery. This was phase 2 of our nursery. In this photo I am kneeling where the greenhouse would end up a few years later. You’ll see that below. Also here digging away is Duston in the black cap. The other two kids are my nephews. We are planting all kinds of weeping trees that I bought from a guy that does a lot of grafting. It’s important to note, you can make more money faster with shrubs that you root as cuttings or perennials. The weeping trees were my thing, but small shrubs or even rooted cuttings are far easier to sell. In this area we had all kinds of fun and interesting weeping trees including Weeping Nootka Cypress, Weeping Cherry, Weeping White Birch Rainbow Dogwood trees, Tri-Color Beech, Sargent’s Weeping Hemlock, Harry Lauder’s Walking Stick and a few other things that I don’t remember now. Later I added weeping Japanese maples to this area as well. This is the same area as above. I sold those trees and dug out these beds when I switched to container growing. I was lucky then and I’m lucky now. My soil drains really well and I can do this. 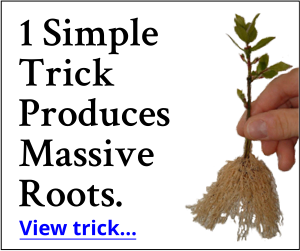 If you have poor draining soil this would never work. Off to the left you can see my propagation bed. Back then I used the same technique that I use now. Looking at this bed from the other direction. To the left is the shed and the brick patio. Straight ahead the container beds, propagation bed to the right and all the way up by the house my greenhouse. I used that for grafting Japanese maples. Growing small plants in the backyard. There is a lot going on in this photo and this really is very a efficient use of space. Container beds are full of growing plants. Note the arborvitae along the left edge of the propagation bed. I planted those there so I could later tear them to shreds for cuttings. Behind the shed is the potting area, including a pile of potting soil. Off to the right and way back by the white fence is our second container area. People who came into our backyard were amazed an in awe that we could do so much in such a small space. The brick patio, out of sight is off to the right. Plants growing like crazy in our backyard nursery. Same area, I took this photo standing near the backdoor of the house. As you can see, things are growing well. The small group of plants in the front corner, where the yellow plants are, those were Kevin’s. He grew them from cuttings, potted them up and sold them at our plant sale. He kept the proceeds. The above photo I took from the roof of the house. That’s how crazy I am. Note the greenhouse in the foreground. That only lasted two years and was done with a greenhouse. Been growing without one ever since. More than 20 years later not much has changed. We now have a new nursery and Pam is still there with pruning shears in hand making things look awesome. All kidding aside, she is an awesome pruner. During our plant sales she goes around trimming everything up to make it look it’s best. As I am working on this article she is upstairs in her sewing room making things for the babies. It’s March 3rd, we’ve got less than a month and we will be up to our ears in plants once again as the weather warms in Ohio. Mike McGroarty taking a break in a wheelbarrow. Me? I still sit in a wheelbarrow every chance I get. But I now also have a Hammock in the Donkey Pen so I let Finnegan and Fergus torment me while I take a break. And trust me, they torment me when I’m in that hammock! So far they’ve only knocked me out of the hammock once! Plants snugly covered with snow for the winter. To me this is a beautiful sight because I know that as long as my plants are covered with snow they are happy and safe and sound until spring. Mike and Duston, snowman building. Completely but maybe not really, unrelated. Pam and I lived in this 600 square foot house when we got married. I actually had a nursery behind this house as well. It’s a long, ugly story but we got stuck in that house for 12 years before we bought out first home, the brick ranch that you see in all of these other photos. Backyard Nursery completely hidden behind the shed and the patio. Keep in mind, our lot was only 1/2 acre, the nursery only took up 1/20th of an acre. This is the compromise. Pam tolerated the nursery if I would build her a brick patio with a waterfall. The nursery is off to the left and out back along the fence completely hidden with the landscaped mounds, which started out as big piles of dirt that I had to make go away. So I landscaped them! Landscaped mounds in the backyard. Making money with plants at home. This is the back container area. The patio is off to the left in this photo, the white fence belongs to my neighbor. This piece of the nursery was pretty much hidden from everybody. The potting area is straight ahead, behind the shed. Beautiful backyard, small, hidden plant nursery. In this shot you can see the patio and past the patio is the container area that you saw at the top of this page. This is how I used to make my potting soil. I’d pile up the mulch, on top of that I’d add compost, on top of that I’d add some silica stone for drainage, then mix the edges with a rototiller. Right after running the rototiller around the edges Kevin is shoveling what he mixed to the top of the pile. We never mixed the entire pile, just what we intended to work with that day. How to Make Your Own Awesome Potting Soil. See this page. What you don’t see in this photo because I was standing in front of them when I took the photo, but it’s My Lazy Man’s Three Bin Composting System. Mike’s Famous Legless Potting Bench. We potted behind the shed, it was an easy carry to either container area and the potting area was pretty much hidden from the world. You really need to check out all of My Potting Bench Ideas, Including the “Outhouse Potting Bench”. And now, here we are all these years later and this spring I think I’m going to build a new potting system. Stay tuned for that. I’ll post photos when it’s done. A customer giving Pam money for plants? Not really, we staged this photo because it’s not cool to take photos of your customers and upload them to the world wide web. But this photo is really, really interesting because . . . Kevin is on the left, Duston in the background on the right and the pretend customer? That’s Duston’s now wife, Lorelei. This photo was taken long before they were married and now here they are all these years later with boys. By the time you read this Kevin will have two children as well. Getting ready for a plant sale! Finally you get to see the front of the house as we prepare for our spring plant sale. We held our last plant sale at this house in 2003. In about four weeks we sold over $25,000 worth of plants from our driveway, every single plant was priced at $4.97. We moved a couple of years later. Today, at The New Location, our price point is $5.97 and sales are just as brisk. Come and see us at Mike’s Plant Farm this spring, 4850 North Ridge Road, Perry, Ohio 44081. If nothing else, come and say high to The Donkeys, Finnegan and Fergus. Thank you for taking this stroll back in time with me. I truly enjoyed putting this article together. Keep in mind, you don’t have to go hog wild crazy like I do. 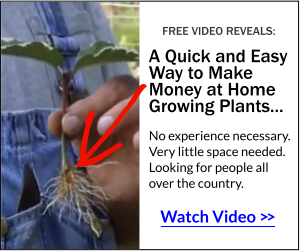 Here I show you how to make 65¢ per Square Inch Growing Small Plants. Mike, Thanks for sharing that, it was enjoyable. Hi Mike, I’ve been following you for several months and have recently started propagating plants (but no roots yet). When I read your article about your first backyard nursery, you said you recessed the plants below grade. What is the purpose of doing this? How can I test if my soul drains well? You test your soil for drainage by digging a hole and filling it with water to see how fast it takes to drain. Google perk test. For most people recessed beds are not possible. We have lots of members in southern states, including North Carolina. Everything that I teach applies. There are a lot of ways to about this but when you put plants in the ground they have to later be dug and potted. That’s a lot of work, much harder than most anticipate. Pots are better. Selling online is tricky and there is a learning curve. But many of our members sell in our members area, http://backyardgrowers.com/join with success. I won’t make income promises. We have members that do very well, but I can’t promise anything. Hey Mike, Thanks for sharing, I tip my hat to you sir. Beautiful yard and always good to have help, which I need. HAHA. For 16 years I have followed you and now after joining I am almost ready to join the family. Working slow to get it right. Thank you so ever much. Thank you for being a loyal fan for all of these years. At the very least test drive the members area, http://backyardgrowers.com/join, when it opens up again, right now it is on fire with activity. Thank you Bob, I appreciate that. Such a hardworking Family and life long hard work you have done. I work In my yard, flowers, one or three tomato plants. Love to watch plants grow . trouble is getting old (70) and having joint problems, and cant do so much any longer. in the past. I grew up with a father who had a big garden and a mother who canned the produce. i know hard work. I love to read your web site, reminds me of my folks who have passed. We lived in the country then, We are in the city now. And love to see your pics of yard currently with all the ornamental trees. You are truly inspiring! I have planted 3 laceleaf maples, one august moon, 1 peegee hydrangea , in the last two yrs in my yard. Have others also to prune and care for. Going to try to prune the laceleafs like you do!! You and your family are such a pleasure to hear about. THANK you and May God continue to bless you. Thank you Eleanor! Enjoy those plants. who need teaching. You are AWESOME , thank you !! Thank you Martha, your kind words are appreciated. WoW, what you sow is what you reap, only bigger! Have not been a loyal reader I got to admit but now that you have created a really interesting website,(with color yet Mike), I must say….pretty impressive. Live those pink potentilla ; they aren’t so easy to find. What is their heat tolerance zone? Recall when you started. You certainly have come a long way. Potentilla should be fine through zone 8, maybe zone 9 but I won’t promise that. Mike, I enjoy your emails so much I’ve shared them with many friends. This one is the best yet, with all the links. We consider you are garden friend! Keep up the great work! for many years but this really inspired me. THANKS FOR ALL YOUR INFORMATION ON PLANTS, WISH I COULD VISIT AND BUY SOME OF YOUR GREAT PLANTS BUT I’M ON THE EAST COAST AND DON’T TRAVEL ……….KEEP UP THE GOOD WORK YOU AND YOUR FAMILY!!!!! So cool to still have great shots of everything! I would live to see your yard at the new house! What a great read Mike. We love to get your emails here in the UK. I just want to cry when I see the work you have done, it’s beautiful. I love how your family is involved. You have done the right thing when it comes to using your land. Bless you. Now THAT”S inspiration! I am going to do it again Mike! This is a great way to make extra money. Have a IRS Tax return coming? Mike has shown how to start with a portion of your back yard as well. Not all plants make it, but most will when you learn from Mike’s videos. No pots, try Landscape contractors, Nurseries, recycle places, they give and throw pots away, you might as well re-use them for free! The members on his forum will help you. I invested 7 dollars for a trial to start, Liked it, and signed up for some great education. Make sure any plants you purchase have the Specific Latin or Greek Name on the tag, No, Mike does not send out Skittles for Plugs! Thanks Jim, I appreciate it. Mike,do you have a start date set yet for your spring sale this year..i live in stark co. and really what to visit your nursery asap this spring.. Typically we don’t get started selling until mid to late April depending on the weather. Great stuff Mike – I’ve been following you for a while and always am delighted to read your blogs. Your story is a tribute to the greatness of America and your families contribution as part of that greatness. Thanks for all that you do. Enjoyed the trip down memory lane – Thanks so much for sharing it. I love your book, but cannot propagate to sell, Too old, but love doing this for myself and family. We just cut down 9 large Eucalyptus trees and had them mulched. Not realizing how much mulch that would be, I have 5 huge piles ! WE have used quite a lot of this to cover areas where we have removed grass due to drought..
Do you have any ideas how I can use this as a growing medium, or what to do with it?? Thanks for all you ideas and help. It would have to decompose for a long time before you could use if for a growing medium. Several years for sure. If you incorporate the mulch into a compost pile (as the carbon source) it will break down much faster. Monitor the temperature and just boost the nitrogen as needed (grass clippings, or even blood meal will help). You could also consider selling it to the neighbors.. Good luck! Mike is right and of course if you keep the piles flat and low they’ll get wet all the way through and decompose faster. We just cut down 9 large Eucalyptus trees and had them mulched. Not realizing how much mulch that would be, I have 5 huge piles ! Patrick, it’s not as big as you think. The nursery took up 1/20th of an acre. I’m a picture guy and this email was just great, thanks for the info. I’m trying to decide whether to buy into the backyard growing thing when it opens the next time. We’d love to have you back, things always changing at the nursery! Thank you Mike. I was gardening before but it all became too much work for too little reward. Thank you for inspiring me to have another go. The bonus for me is that my garden is getting tidier every time I take cuttings and plant them. So, win, win! . You are incredible. Fantastic website that you don`t have to pretend to understand. This was great. Looking into your photo album and you sharing with us as if we were all family. You’re a great man. Because of you I have 6 4×4 raised bed and one 4×8. I raise food every year. Some years better than others. But I am learning what grows and what doesn’t grow well. I have learned to grow only what I like to eat and not grow what is easy . Thanks Condee, I appreciate it. Mike, I can only say, as one Buckeye to another, you are one awesome dude. Thanks Mike, you’re pretty awesome as well.